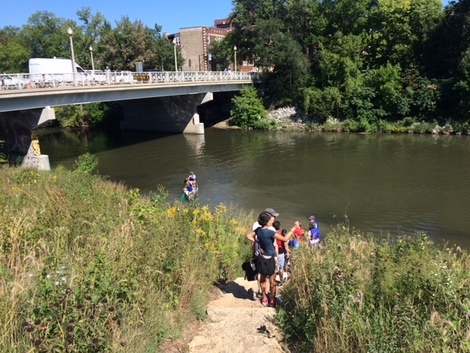 Margaret Frisbie, executive director of Friends of the Chicago River (center), talks about the restoration work at Horner Park on a recent canoe outing for staff and board members. 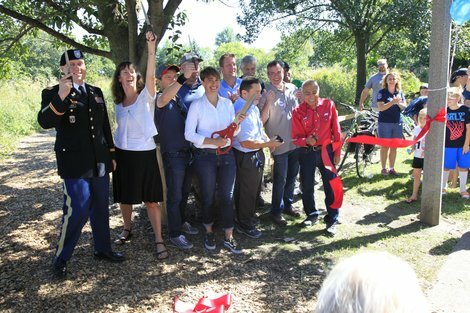 It was a Saturday of celebration for Horner Park as Friends of the Chicago River join neighbors and local and federal officials to mark the grand opening of the restored riverfront at Montrose Avenue on Sept. 15, 2018. It’s been a long time coming. In 1999, then-Mayor Richard M. Daley’s Chicago River Corridor Development Plan proposed improvements for Horner Park, 2741 W. Montrose Ave., including removing a cyclone fence to allow for better public access, re-grading the riverbank and replanting the riverbank with native species. In 2000, the Horner Park Advisory Council and Friends partnered to create a study on how to make the vision a reality. The $5.6 million project, which began in April 2014, triggered news stories and a detailed public review because some neighbors were concerned about the removal of trees. Fortunately those concerns were addressed and the site plan was revised to save the maximum number of trees, add more diverse species, and install a woodchip trail along the water to complement the nature trail at the top of the new bank. Invasive plant species were removed and replaced by 128 native trees and 282 shrubs to combat erosion. 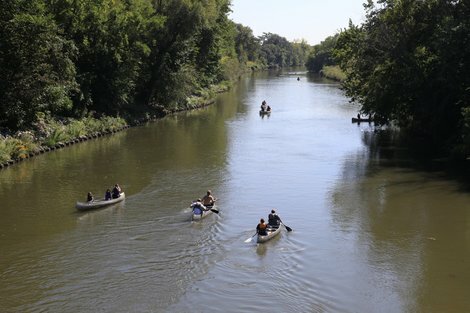 Two acres of riverbank were added though a lease with the Metropolitan Water Reclamation District as well as a new canoe and kayak landing. 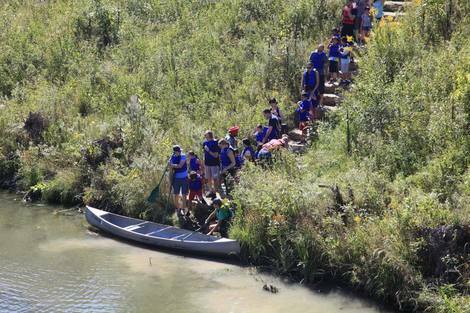 “The project is a terrific example of how we can remake and reshape our riverbanks,” said Friends Executive Director Margaret Frisbie. "This is exactly the kind of project that we want to see along the Chicago River. 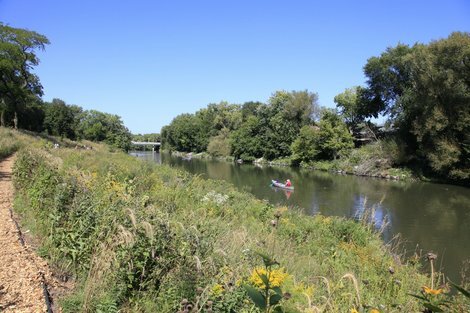 It will open up the river to the community there for the first time and become a healthy habitat for wildlife of all sorts." The Chicago Park District and the U.S. Army Corps of Engineers are funding the project through the Great Lakes Restoration Initiative. 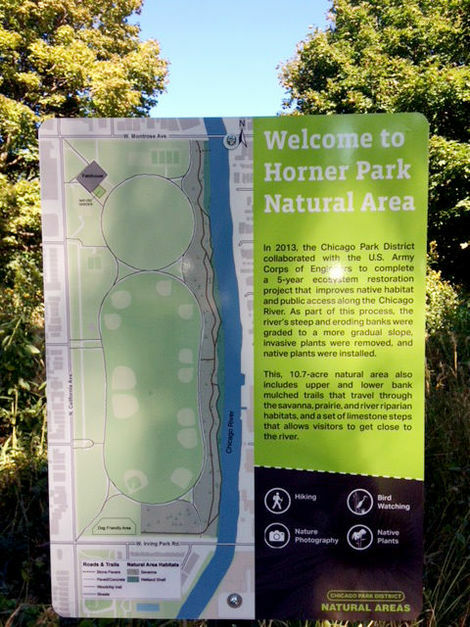 The improved Horner Park was officially unveiled with a ribbon-cutting ceremony sponsored by the Chicago Park District, the U.S. Corps of Army Engineers, Ald. Deb Mell (33rd) and the Horner Park Advisory Council. Also on tap: free canoe rides, live music, a nature scavenger hunt, miniature boat races and other activities for kids.